Cover for Kettler table tennis tables. Besides Kettler cover, protecting optimally from dust, dirt, and humidity, four stable table tennis bats as well as diverse table tennis balls of different quality of brand manufacturer Joola are provided in delivery of the Kettler table tennis accessory special offer set. Protect your table tennis table against dirt and humidity with the Sponeta cover. The Sponeta cover is suitable for almost all foldable table tennis tables. Top model of the Joola table tennis nets. 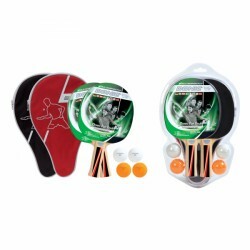 The Donic Schildkröt table tennis set Top Teams Cover Set 400 is a table tennis playing set for beginners or ambitious leisure players. The set includes two table tennis bats Top Team 400, two cases, and four table tennis balls. 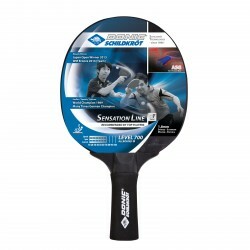 The Donic-Schildkröt table tennis bat Sensation 700 is ideal for ambitious leisure players. Being equipped with the innovativen ASG system, the grip (concave) is covered with a soft foam, which absorbs the sweat, provides a non-slip grip, and reduces strongly the vibrations. For a comfortable playing experience with high ball and hit control! 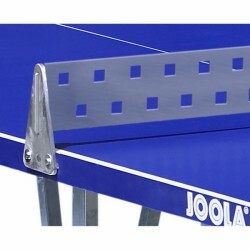 The Joola table tennis net in a stable all-metal version as accessory for the table tennis table Joola Externa. Weatherproof ! 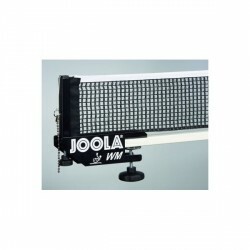 corresponding accessory for the table tennis table Joola Externa. weatherproof and extremely robust ! 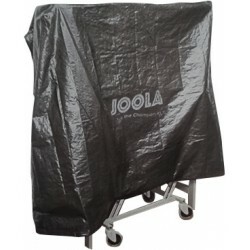 The Joola TT table cover is an excellent accessory to protect your table tennis board from water and pollution. It is mounted by hook-and-loop straps. 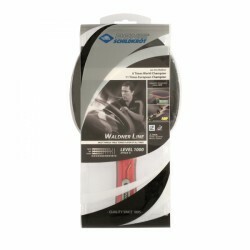 The Donic-Schildkröt table tennis bat Waldner 1000 concave is a bat of highest quality. It's mainly the adjustable weight and the ergonomic shape, which make it perfect for ambitious players. The Donic-Schildkröt table tennis bat Waldner 1000 concave is equipped with two high-quality carbon inserts for an aggressive attack playing without compromise. 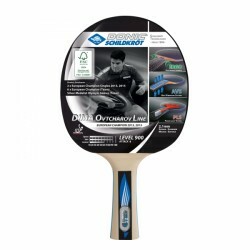 The Donic Schildkröt table tennis bat Ovtcharov 900 is a sturdy table tennis bat made of sustainable FSC® wood for advanced playing techniques with good spin and high speed (ATTACK). High-quality components characterise the table tennis bat Ovtcharov 900: Ergo grip, first-class competition wood, 2.1 mm thick sponge thickness, and non-slip Schildkröt Spinmax rubber. Fit perfectly, fully cover the table, has a strap to fix bellow the table. Fits perfectly. Could be a bit stronger material. Otherwise good buy. Good, well made cover. Easy to put on as it has two zips, but even without undoing the zips it can just be slotted over the top. It ties easily underneath. Good cover which does the required job. If you buyt a Cornilleau table or any other table tennis table then this cover will definitely do the job of protecting your table tennis table in all weathers. Easy to put on and take off. 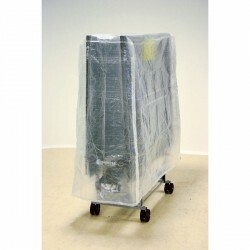 If you are buying an outdoor table tennis table then you will need a cover. This cover is very good. Easy to put on and take off. Fits very nicely, haven't figured out the elastic attachment. A few instructions would not go amiss. The category table tennis accessories offers practical and additional accessories for your table tennis equipment. Either table tennis nets, covers or maintenance sets - here you make a strike !